They're little, they're cute, and they're cube-tastic! The My Mini MixieQs world is just like ours, except it's totally cube-ular! Get ready for new collectible figure excitement in trendy fun settings kids know and love. When closed, these miniature My Mini MixieQs Playsets fold into a cube that fits in the palm of your hand, perfect to take on the go. Open them up and discover multiple play areas, themed furniture, colorful details, 2 themed collectible figures, and 1 mystery figure! All the mini-figures feature Pop and Swap hair and outfits so you can share and exchange them with other characters to customize your My Mini MixieQs. 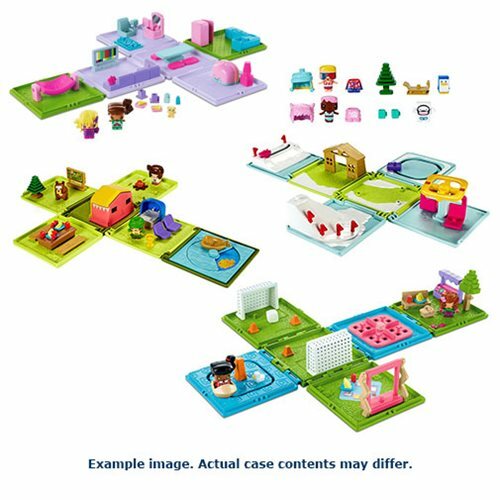 Then connect and stack the playset to other My Mini MixieQs Playsets and Mini Rooms (each sold separately) to keep the fun growing! Colors and decorations may vary.